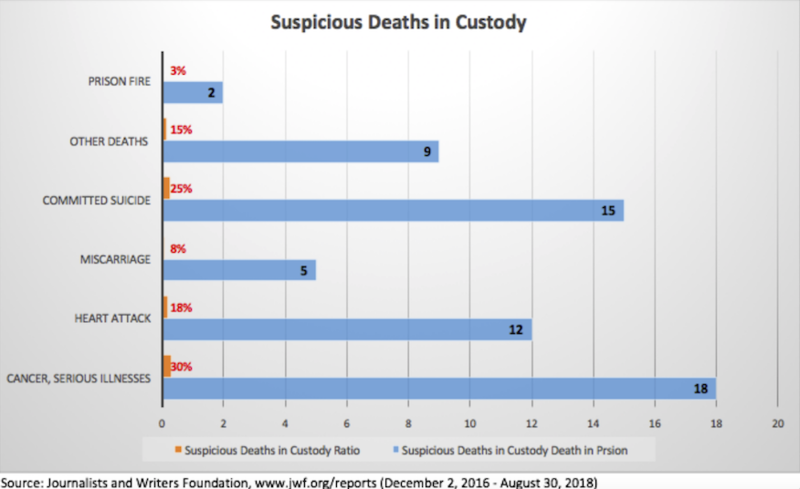 The New York-based Journalists and Writers Foundation (JWF) released a new report titled “Death in Custody: Right to Life in Turkish Prisons” expressing concerns over the increasing number of suspicious deaths in custody since an attempted coup on July 15, 2016 in Turkey, taking place in suspicious circumstances and in a pattern of systematic recurrence. JWF urged the international community to ensure the protection of individuals who are at risk of arbitrary deprivation of their life because of unlawful actions in Turkish prisons by state agents acting on behalf of the Turkish government. JWF also called on the international community to address, as a matter of priority and importance, the deteriorating human rights situation in Turkey. Turkish authorities accuse the Gülen movement of orchestrating the coup attempt, although the movement strongly denies any involvement. Still, the government launched a crackdown on the movement, publicly denouncing those who have any affiliation with it. President Recep Tayyip Erdoğan repeatedly called on people to inform on their neighbors or relatives to the police if they had any links to the organization. Since the abortive putsch, more than 400,000 people have been investigated by Turkish prosecutors over alleged Gülen links. According to Justice Ministry data, in excess of 30,000 people with alleged links to the movement are in prison. Research conducted by Human Rights Watch in Turkey from February to September 2017 revealed accounts of severe beatings – resulting in bleeding, fractures and burns – in addition to electroshocks, unnecessary strip searches and sexual assault. A report released in 2017 by the Platform for Peace and Justice further confirmed ongoing beatings. The organization summarized the ill conditions resulting from overcrowding, such as inadequate shower and toilet facilities, and a shortage of food and beds. This article originally appeared in Turkish Minute on Sept 10.